Wow! Is this actually the Italian band? Never ever could I have believed it! While the 2002 album Hastings 1066 was an excellent and apt piece of Italian symphonic speed/power metal (in the vein of Rhapsody), the band’s new opus is carrying them into new (and unexpected) territories. Depicting the XV-century story of the Maiden Of Orleans – Jeanne D’Arc who inspired the French people to fight against the British enemies, the album takes you into a magic ride (both lyric and music-wise) into the French Middle Ages allowing the band to display their uncanny ability to blend epic bombastic elements with modern power metal sounds. Let me start with the production first. Excellent balance between the instruments, with a strong and vibrant bass sound, crystal clear twin guitar leads and pristine keyboard/synth (background or lead position). Special note for the lively drum sound that binds all the elements together for a tight and strong sound. The new addition to the band, the lead singer Giulio Di Gregorio fits very nice with the overall sound, backed very well by the guitars and the rhythm section. The style of the band has changed significantly. Aside from the classic epic metal style, the band has ventured also into typical US power metal (powerhouses style like Kamelot and Jacobs Dream come to mind) with superb dual guitar-keyboard rhythm and strong pounding drumming and into teutonic metal with vibrant choirs (Blind Guardian trademark) and complex fast riffs. Blended into the mix we also have medieval choirs, battle sounds and blasts of trumpets enhancing the mood of the concept album. Giulio Di Gregorio’s voice is warmer than Dario Grillo’s (former vocalist) and while on the first tracks he sounded like a younger version of Falco Orlandini (lead vox on the legendary Time Machine album Act II: Galileo), the more the album progresses, the more confident his voice is, showing excellent range with the mid tones, but also using his high notes on the peaks of the compositions. More than once I found myself comparing his voice to Daniel Heiman’s (ex-Lost Horizon) and I think that Di Gregorio has the potential to become a power voice in the metal genre. The first surprise of the album comes right after the epic intro (Revelations), with the opening track Maiden Of Steel which is such a powerful display of US power metal, with a double guitar/keyboard rhythm, fast hooks and a serene yet powerful voice in the purest Kamelot style. The pace of the album is pretty high, with the beautiful and complex The Chosen following, with good build up, clear vocal lines backed by choir and a terrific extended technical dual guitar solo. The extended instrumental parts, with excellent guitar solos and underscores seems to be one of the band’s best qualities, so while the main melodic line is epic power, the guitar work (especially on the adept solos) is deeply rooted into the progressive area, the axemen – Maurizio Malta and Giovanni Santini converging into one of the most gifted guitar pairs I’ve heard in a long time. The guitar work on Siege Of Paris, Ride To Chinon, For Orleans or the previous The Chosen is absolutely brilliant showing strong musicianship and high talent. Fast tracks like Ride to Chinon or Up To The Battle blend with the mid tempo tunes like The Rise Of A King, a keyboard driven with epic sound, or the more symphonic Siege Of Paris and the 8-minute epic For Orleans. As we go on with the album, the mood changes, from the power/speed opening tracks we shift to more complex arrangements, symphonic sounds, epic choirs and bombastic double-bass drumming, increasing the power of the story. Multiple layers of synth sounds, background keyboards underline the catchy rhythms and polish the rough edges. As the story moves along, the atmosphere of the album becomes darker, passing through bloody battles, treason and deceit, converging to the doomed end. The final track, The Trial, 9-minute long is a sum of all the characteristics of the music, symphonic layers, operatic choirs together with complex guitar work, backed by solid drumming. Giulio Di Gregorio delivers the best performance on the album while the Malta/Santini guitar team show their impressive talent. All these elements blend together to reach a full sound and bring a glorious end to the story. No metal fan should miss this album. The diverse sound and the talent displayed make this one of the best releases of this year in the epic symphonic area. 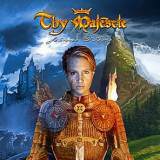 With each album, the Italian rockers Thy Majestie improved tremendously their sound. At this pace, it’ll take them one or maximum two albums to reach the highest level of recognition. They fully deserve it.